The midsize sedan wars are about to get very interesting, with the 2019 Nissan Altima making a loud debut at the New York International Auto Show today. Promising some seriously innovative engine technology, combined with the automaker’s ProPILOT Assist driver-assistance gadgetry, it’s the sixth generation of one of Nissan’s best-selling models. You’d almost forgive the automaker for playing it safe, therefore, when so much is at stake. Problem is, the midsize sedan segment is fiercely competitive and only going to become more so. Nissan had to bring its A-game or risk fading from sight. So, A-game it is. On the technology side, there’s ProPILOT Assist which is now standard on the 2019 Altima AV, SL, and Platinum trims. Point the system a the right sort of road, and the car can automatically control its own speed, braking, and steering. It’s only single-lane highways for now, but it’s more than you’ll usually find in the segment. Under the hood there’s more newness. Gone is the old 3.5-liter V6, replaced with the variable compression turbo inline 4-cylinder engine. The 2.0-liter VC-Turbo uses the same technology we’ve seen Infiniti play with lately, but it’s the first time its been found in a Nissan. It’ll make a big difference, too: the automaker is predicting a double-digit improvement in economy versus the old V6. The second – and standard – engine is a 2.5-liter inline-four DOHC engine, which Nissan says is not only more powerful than before (with 188 HP and 180 lb-ft. of torque) but more refined, too. It’ll be offered with front-wheel drive or all-wheel drive – the VC-Turbo is front-wheel drive only – using Nissan’s Intelligent All-Wheel Drive system, again a first for the Altima. It can split power 50/50 between the front and rear wheels. Nissan is counting on AWD to coax some buyers out of their crossovers and back into sedans. “We saw that the lack of available all-wheel drive has been a key factor in pushing U.S. buyers who prefer sedans to compact SUVs,” Denis Le Vot, senior vice president of Nissan North America, says. 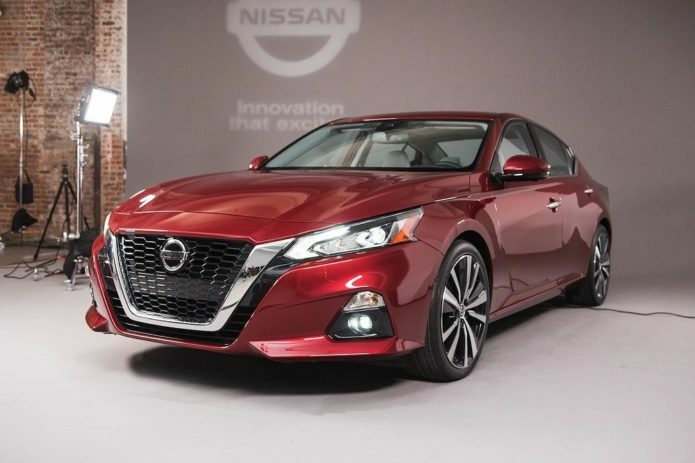 As the automaker is expecting the 2019 Altima AWD to be particularly popular in northern states. As for the exterior, that has grown up some too. It’s lower, longer, and wider than the old Altima, and all the better for it. Up to 19-inch wheels can be added, and the result is a car that looks larger and more premium than it actually is. It has the safety tech of the category above, too, with rear automatic braking added for the first time, halting the car if an obstacle is detected during reversing. It means Nissan’s safety system graduates to a new Nissan Safety Shield 360 title, since it joins front and side safety monitoring. There’s automatic emergency braking with pedestrian detection, lane departure warnings, blind-spot warnings, rear cross traffic alerts, and high-beam assistance. Inside, the dashboard is pared back and smoothed out, with a “gliding wing” instrument panel that cuts some of the visual complexity of the old car. The 2019 Altima gets NissanConnectSM as standard, with Apple CarPlay and Android Auto controlled through an 8-inch touchscreen. Leather seats are an option, giving the standard Zero Gravity seats an upgrade; you can also have a nine-speaker Bose audio upgrade, with active noise cancelation. Nissan will have five trims this time around: S, SR, SV, SL, and Platinum. All will get the 2.5-liter engine as standard; the VC-Turbo will be offered on the 2019 Altima SR and Platinum. Sales kick off early this summer, with pricing to be confirmed closer to release.